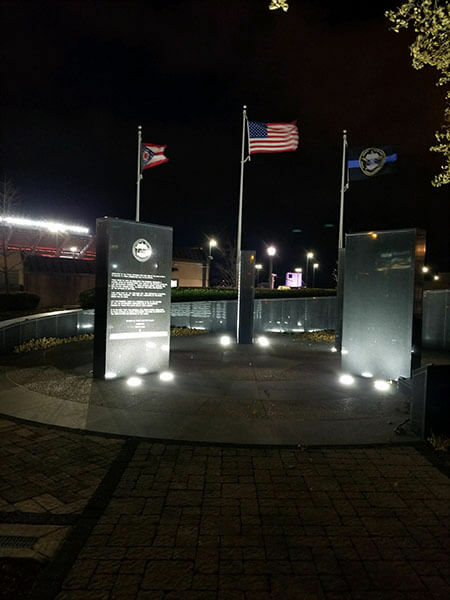 On September 25, 1916, Sergeant Henry Froelich, a 13-year veteran was fatally shot making him the forty-sixth person murdered in Cleveland since January 1, 1916, and the sixth police officer killed in the line of duty in the last five years. Sergeant Froelich, along with Patrolmen Frank and Edward Skala, left the Third Precinct station on a crusade against gun-toters. This was the first night for Patrolman Edward Skala to go on patrol duty in several years. He was formerly on desk duty in the Detective Bureau. While on patrol, the officers noticed four men in the doorway of a store on Orange and East 37th Street. After questioning the four men, the Sergeant decided they had nothing to do with an earlier stabbing in the area. Because of recent police orders regarding carrying concealed weapons, the police began to frisk the four Italians just in case they had revolvers. The Sergeant noticed that one of the men had eased away from the doorway. The Sergeant asked “Where are you going?” and then tried to grab the man who ran down a dark alleyway, turned and shot Froelich point blank with a revolver. As Froelich fell, his revolver fell from his pocket. One of the other men started to run and Patrol Officers Frank and Edward Skala chased after him. Meanwhile, Froelich picked up his revolver and shot off a round. Amidst the confusion, the other two men ran down Orange Avenue. Then a free-for-all of shots followed. The wounded Froelich fired again at the escaping man. A cry of pain came from one of the men but he didn’t fall. The two officers returned to the wounded Sergeant and sent him to St. Alexis Hospital. Chief of Detectives Rabshaw came and took charge of the man hunt for the fugitives. The Detectives took a wounded young foreigner to the hospital on a stretcher and placed him by the Sergeant’s bed. The Sergeant said, “That’s the man I shot, but he isn’t the man who shot me. I hit this man as he was running away.” Chief of Police W. S. Rowe and Detective Rabshaw visited Froelich in the hospital and he relayed this information to them. Froelich died September 25, 1916. Assistant Chief of Detectives, Thomas F. Mahoney, along with Detectives Albert Soukup, Phil Mooney and Michael Bellett, caught John Golatti, age 24, at his home located at 2541 East 22nd Street. Before he was booked for murder, he said, “I was drunk; two men had threatened to kill me. I went home and got my revolver, came back, then the policeman came. I ran away, fired three times, but I don’t know if I shot him.” John Golatti was charged with manslaughter on November 17, 1916, and was sentenced to 1-20 years in the Ohio State Penitentiary. Sergeant Froelich left a widow, five children living at home and one married daughter. Funeral Services were held from his residence at 3037 East 78th Street on Wednesday, September 27, 1916 at 2:00 p.m.
Henry W. Froelich’s name is inscribed on the National Law Enforcement Officers Memorial Wall, Washington, D.C. panel 51, east wall, line 4.